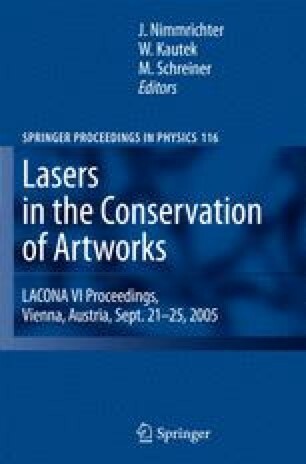 In order to find out whether the existing laser systems can be employed to remove superimposed layers of paint on secco wall paintings in a selective way, laser tests were carried out on three types of prepared samples simulating three stratigraphies that are frequently encountered in practice. OM, EPMA, colorimetry, μRaman, and FT-IR were used to evaluate the results. It was found that Q-switched Nd:YAG lasers emitting at 1,064nm could be employed to remove unwanted layers of oil paint and limewash, but the treatment of large areas requires implementation of a computer-controlled X–Y–Z station in order to control the parameters. However, the applicability of this technique will remain limited as ablation at the established optimum parameters implied a discoloration of the pigments cinnabar, yellow ochre, and burnt sienna. Moreover, it was observed that no ablation took place when the limewash thickness exceeds 25 μm. Unwanted layers of acrylic could be removed in an efficient way with an excimer laser emitting at 193 nm.